Hunting will always be in season with this great wooden toy rifle. When the kids were young at our house, they would make their own rifles and hunt all day. Now that fantasy world has all paid off and they are bringing in the real game. Your child's imagination has no limit as they hunt the big bear, deer, elk, moose and so much more. It measures 3/4" thick and is 36" long and 3 1/4" high. 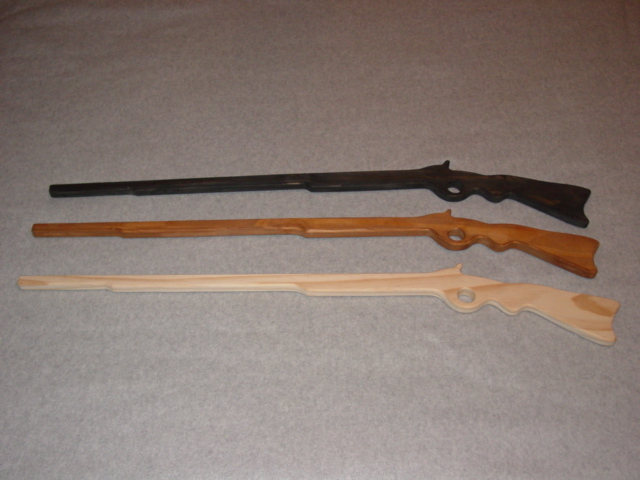 These replica wooden rifles are great to use for dance and theater gun props as well. This will become a favorite toy! This is 1 rifle, please choose your color- black, brown, natural or a clear finish. Personalize it with an ENGRAVED RIFLE!